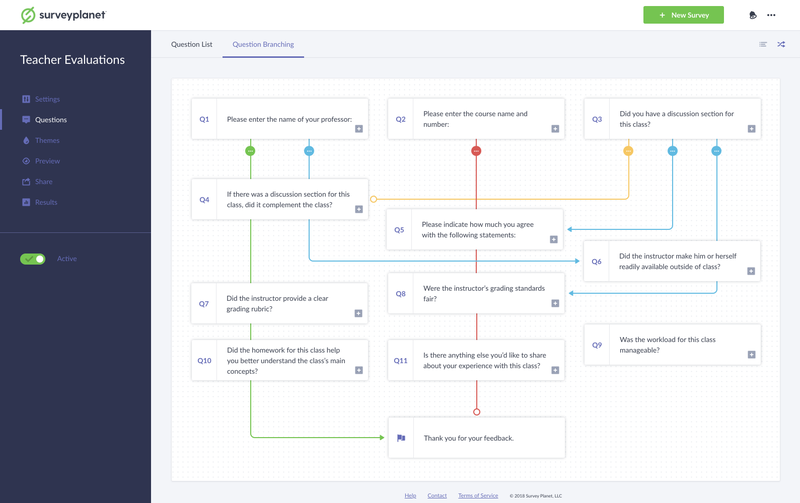 Question branching lets you control which questions your participants see based on their responses to previous questions. For best results, create all survey questions before creating any branches. To create a question branch, go to the Questions page for your survey and click Question Branching at the top. Click the question you want to make the branch off of. 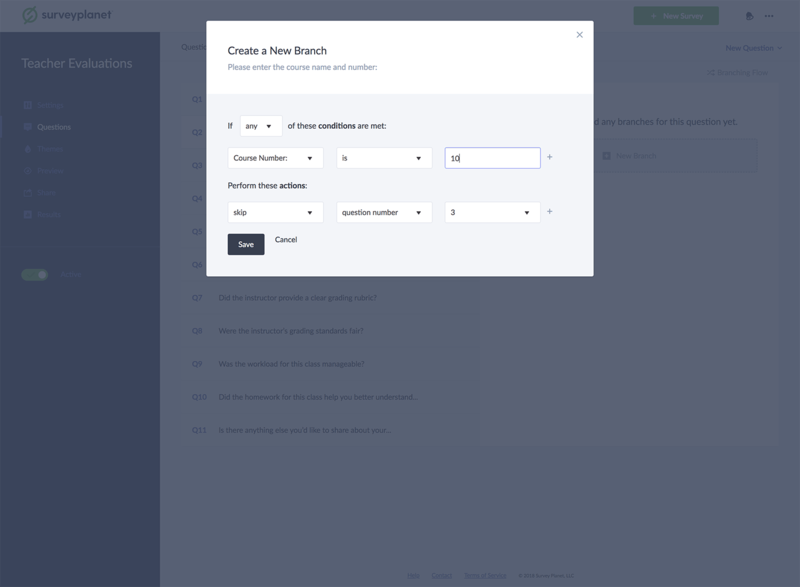 The Create a New Branch popup will appear where you will put in all conditions and actions for that branch. You can add more branching conditions by clicking the + after a condition. You can add more branching actions by clicking the + after an action. The question branch quantifier can be one of two things: if any of these conditions are met or if all of these conditions are met. If you select any of these conditions, then only one of those conditions has to be met for the branch to be true and skip to the question of your choice. If you select all of these conditions are met, then every condition must be met in order for the branch to be true and skip to your next question. Based on the type of question you have chosen, only those branching conditions will be available to choose from. When a branching condition is met, an action will be taken that will change the way the participant moves through your survey. There are four main actions: skip, go to, end survey and disqualify participant. You can skip any question in your survey by selecting the skip action and selecting one of the following 6 properties: question number, question with title, question with subtitle, all questions with type or all required questions . The best way to skip group of questions is to use the go to action but if you'd like to remove all the questions of a specific type or all the required questions use the skip action paired with all questions with type or all required questions respectively. You can go directly to a specific question by creating a go to action followed by question number, question with title, question with subtitle, first question with type or first required question. If you create multiple or conflicting go to actions only the last one you created will be followed and the others will be ignored. You can end a survey by selecting end survey or disqualify participant from the first action drop down. If you select end survey then the answers given up until that point will be submitted. Disqualified participant answers will be discarded. The survey can be ended with the default success message, the success message that was entered in the Survey Settings, or a custom success message which can be specified in the final input field. Suppose you've added a question branch to a multiple choice question. In this branch, if the participant selects "None of the above" as their choice, they'll be taken to the end of the survey. Now, let's say that you've edited your question and changed "None of the above" to "Not Applicable." Making this change will cause your branch to be invalid -- the condition can never be met because the participant can no longer select "None of the above." In the Question Branching tab, this question will have a yellow Warning icon ; hovering over the icon will reveal the "This question has at least one invalid branch" message. If you click on the question to see its branch, the invalid branch will also be highlighted in yellow with an Invalid Branch label. We recommend that you take a look at your Question Branching tab after editing your survey to ensure that your branches have not become invalid.